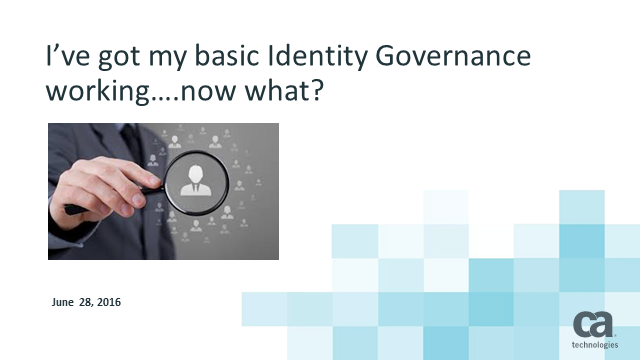 Your identity and governance practices are well established, but they might not be as comprehensive as they need to be. Going beyond the basics is critical to greatly reduce security risk and improve efficiencies. Join CA Technologies security expert, John Hawley, to examine how to broaden the scope of governance to include privileged users, contractors, and business partners, as well as controlling access to physical assets. You’ll also learn the important role of identity performance analytics in a governance deployment. Title: You've Got Basic Identity Governance Working. Now What?